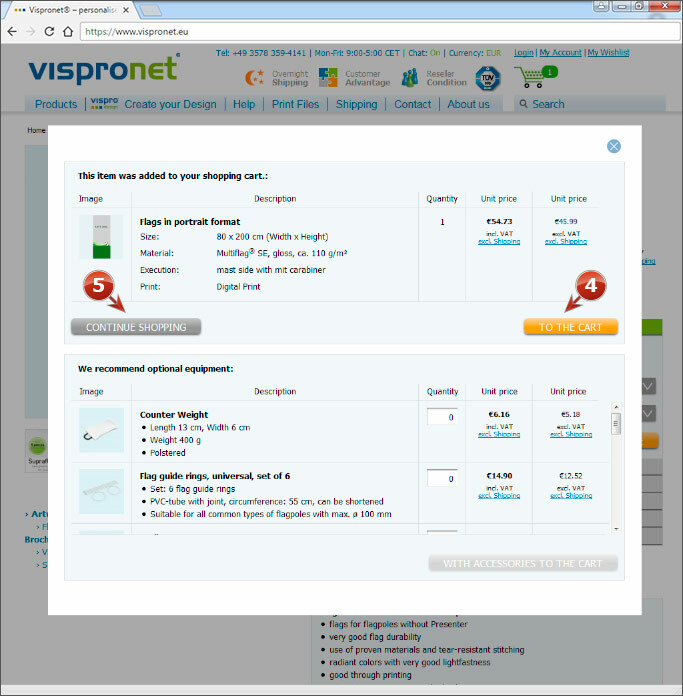 1 Select the desired product group. 2 Select the desired product to enter the subcategory. 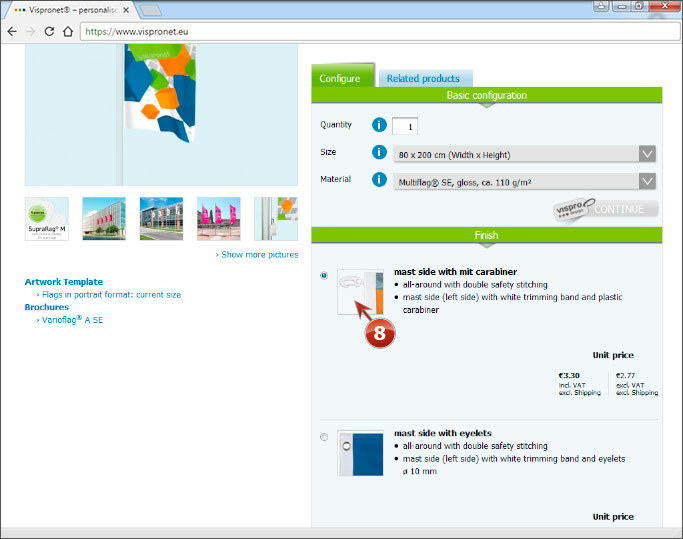 3 You can find further product information in the list view. The product detail page will give you a detailed description 4 of the product, possible printing processes 5 and accessories 6. 7 In the configuration tab you can now specify the basic configuration e.g. number, size and material. Further information on individual options can be obtained by clicking on the i-Button. To go to the next configuration step, click on "next". 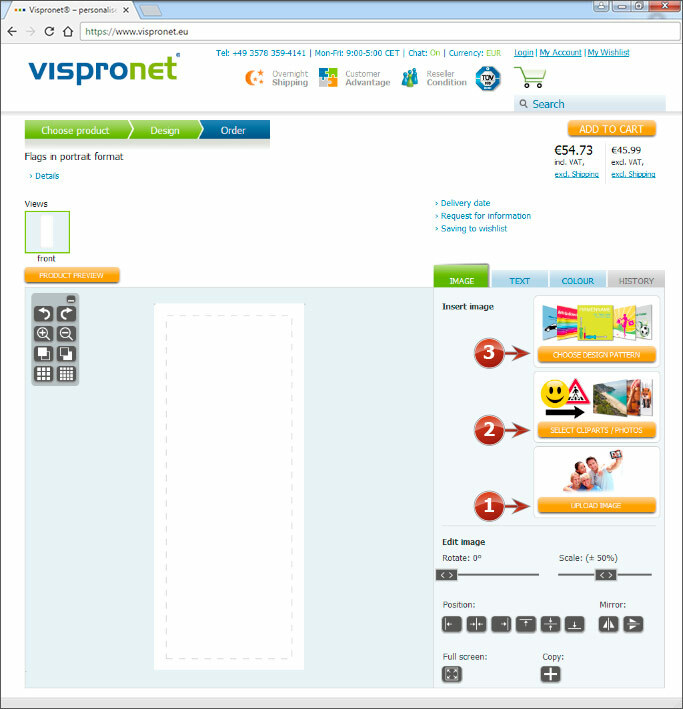 8 Under confection you can for example select a type of garment or a floor element. 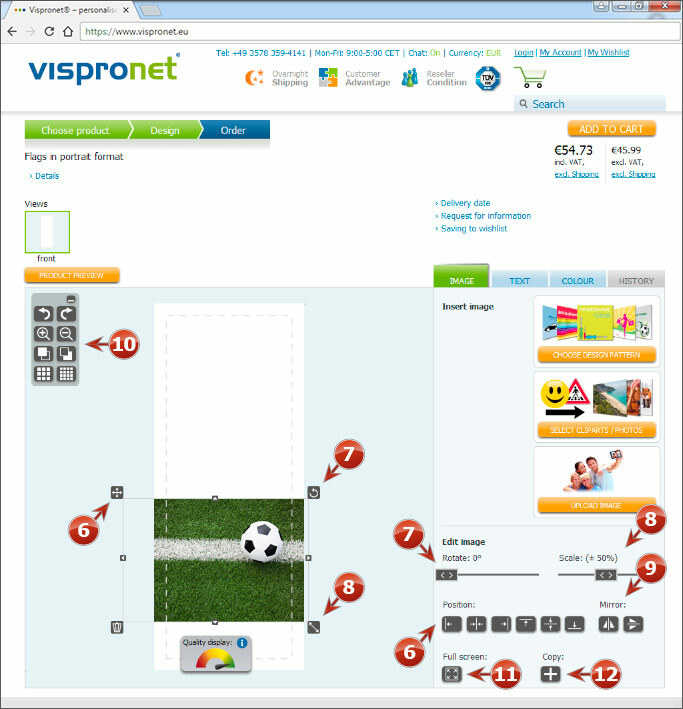 By clicking on the photo, you will find a confection sketch or an image enlargement. 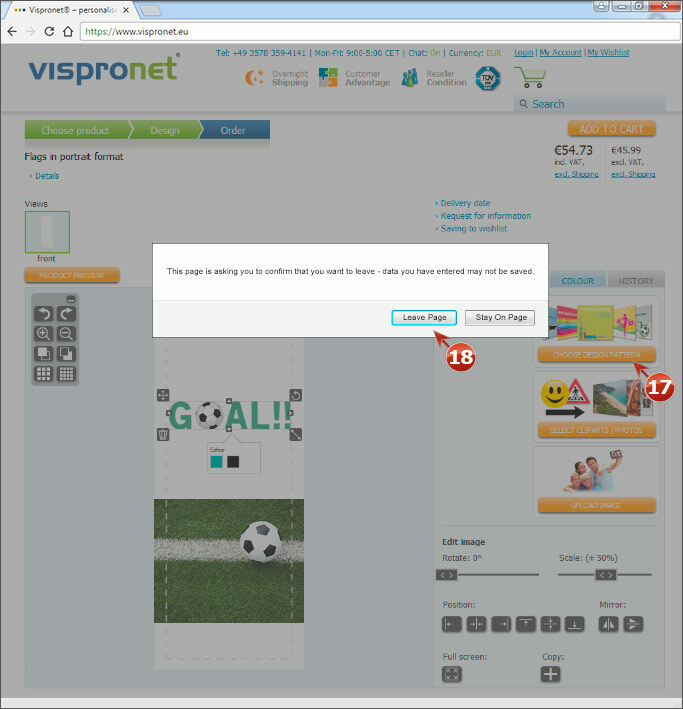 If you decide to continue and "finished print data" 10, you can upload existing print data after submitting the order. Be sure to use the provided layout templates without changing the document format. 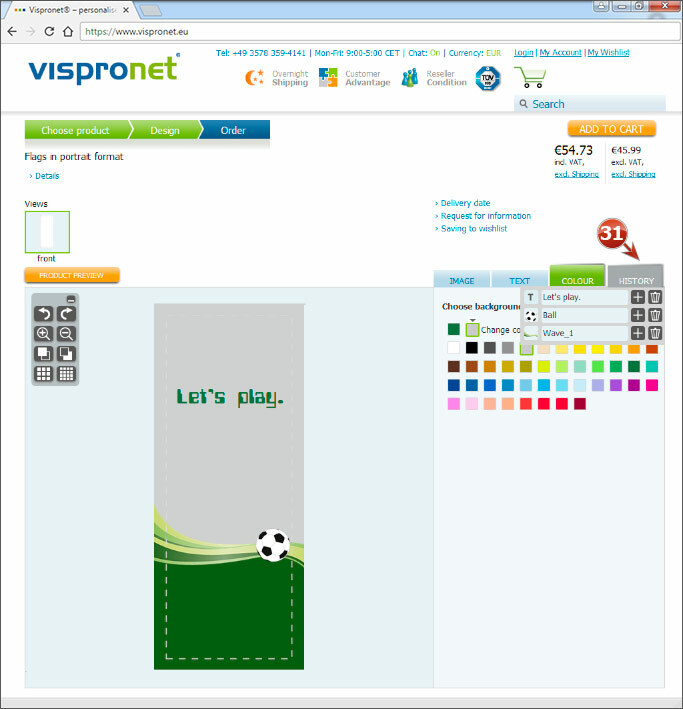 Design your product in Visprodesign® even without prior knowledge of graphic design. Choose "design yourself" 11. 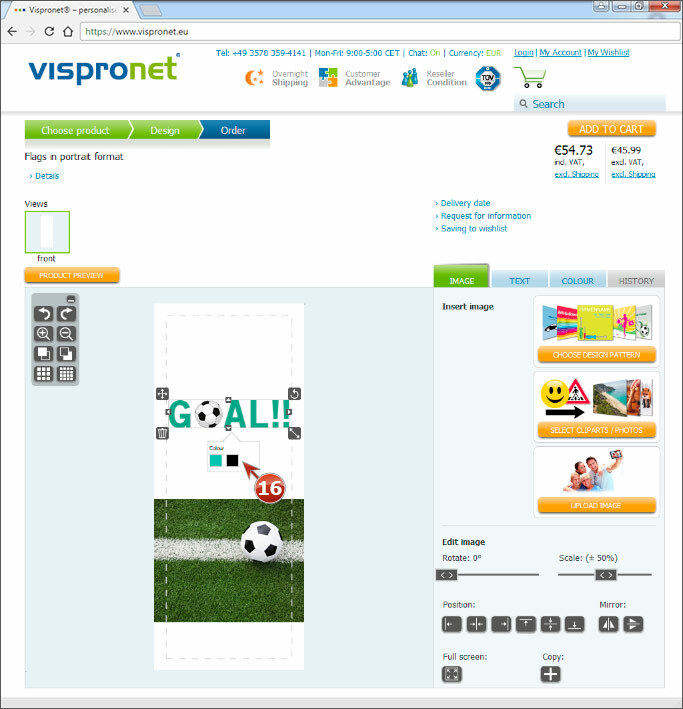 Afterwards, you’ll see an empty design area and can upload your own pictures or use free clipart, photos and design templates for your design. 1 "Upload your own image"
Upload your own images from your PC to the design area. 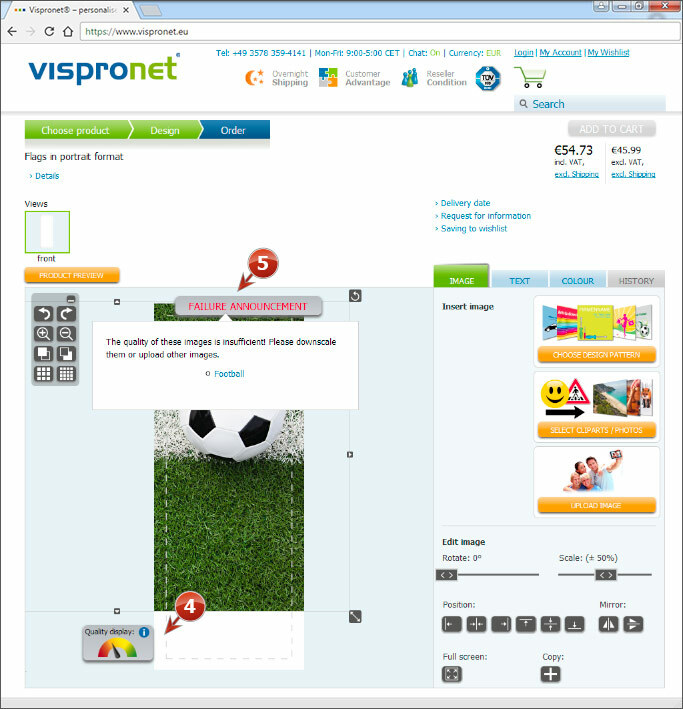 2 "Select clipart / photos"
Choose from our free Visprodesign® image database between suitable clipart and photos. 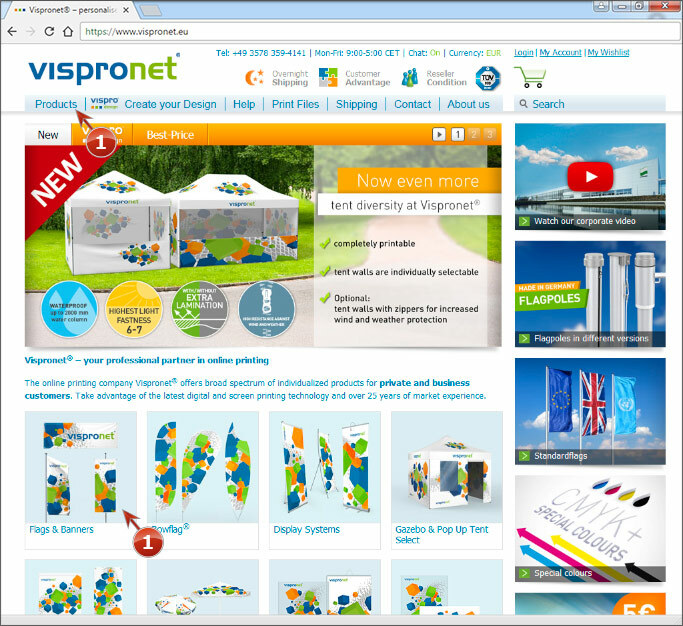 Choose from our free Visprodesign® image database a finished design for your product. 4 The quality traffic light will be displayed on the uploaded images or photos only to indicate whether the resolution in the selected size is suitable for high-quality printing. Further information is available by clicking on the i-Button. Note that the quality changes after each edit. As a result, the resolution of an image deteriorates when zoomed in and can lead to blurred or pixelated print images. If this is the case, you will receive an error message 5. Please resize the image or upload another one. The quality traffic light helps you to check the quality of your uploaded images. Apply the desired clipart or photos to the design area by clicking on the motif. 16 The images from image database can be changed in colour. Click directly on the displayed colour on the picture and select another colour from the colour palette. Browse through the many free design templates available. After clicking on "more" 19 there are additional options under the design preview 20 like "my favorites" and "matching top sellers". By clicking on "add to my favorites" the design template is saved to your individual favorites list. By activating the check box "my favorites" 21 you can view your previously saved favorites. Again, the option "matching top seller" 22 is available. design templates can be combined with other clipart, photos and text. To get back to the design template selection, please deactivate the my favorites" box. 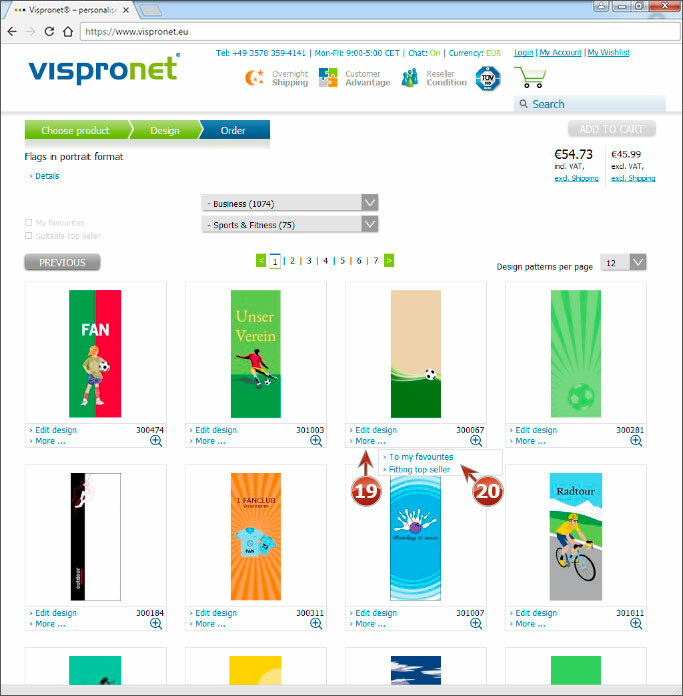 The most popular products with same designs from your favorites are displayed by clicking on "matching top seller". 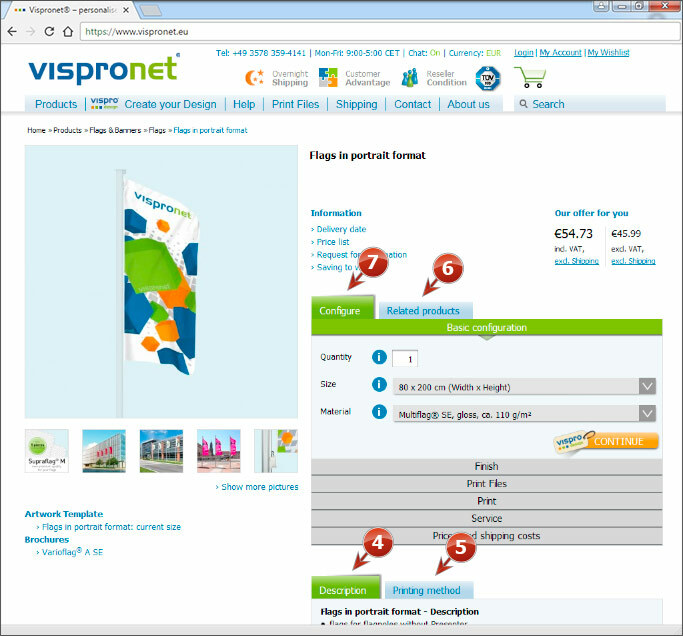 Further information about the product and the price you’ll find by clicking on "prices / details" 24. 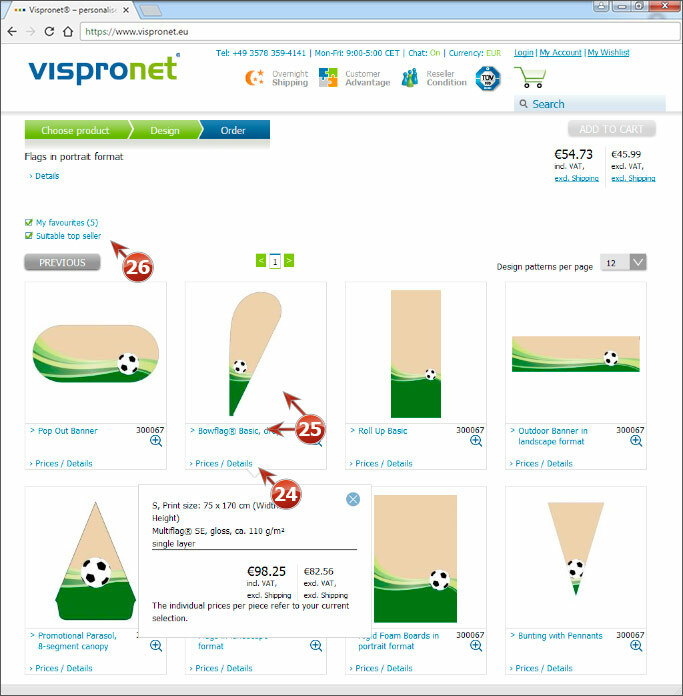 Clicking on the preview image or the product name initiates the design process 25. 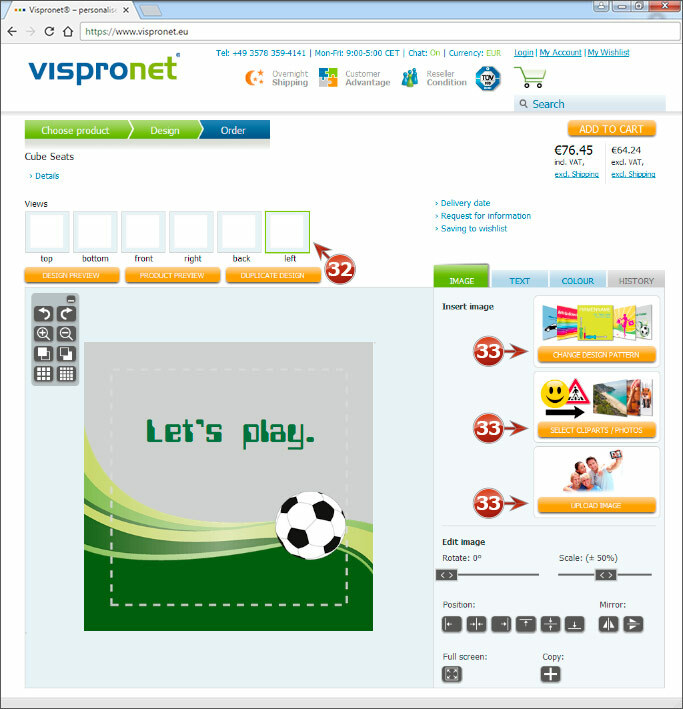 To return to design template selection click the "matching top seller" 26 again. 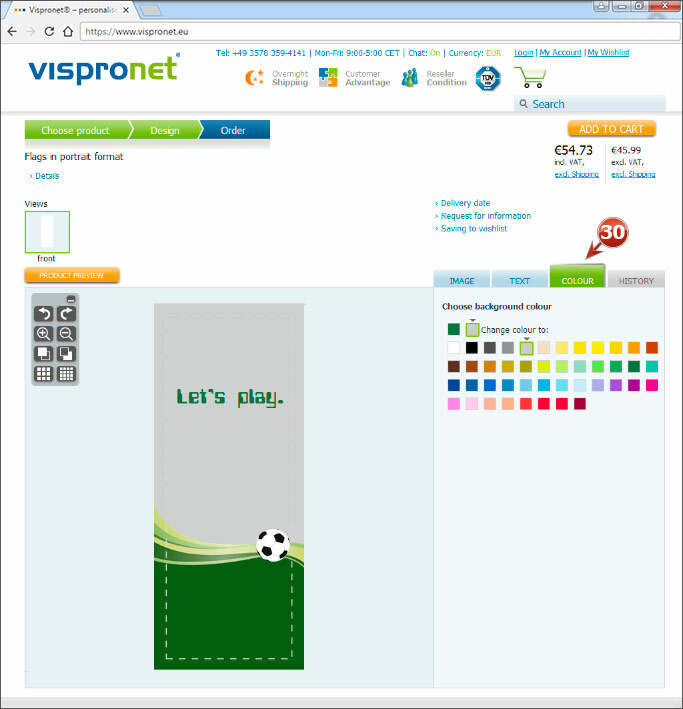 27 To insert text into your design, go to the text tab. 28 Enter your text (also multiple line) in the text field of the toolbox. To change the font and font style, enable the text box in the design area. Then select the desired settings in the toolbox. The font colour can also be changed directly by selecting the text 29. To insert additional text in the design area simply enter it in the text field. 30 Select the colour tab to choose a background colour from the colour palette. 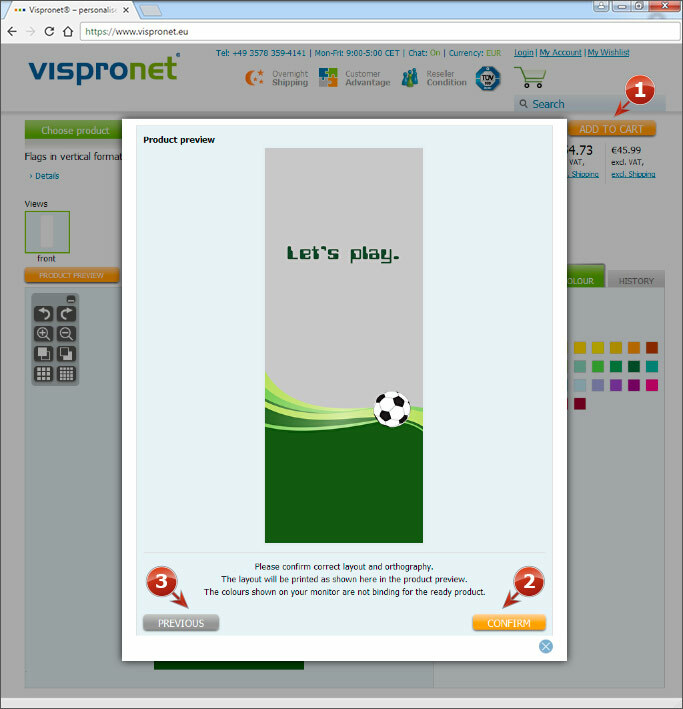 The colour is transferred to the product as a background. 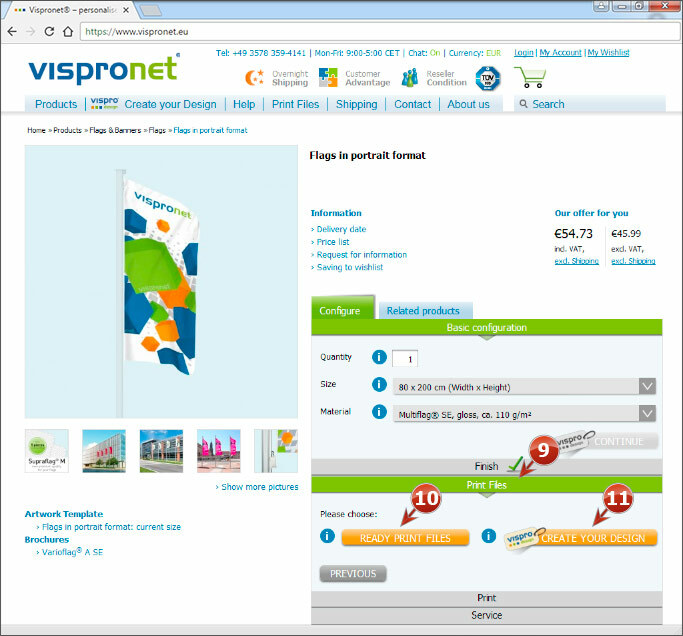 The current background colour for design templates will be changed accordingly. Under the history 31 tab you can access the overview of your design progress and quickly select, copy or delete individual design elements. 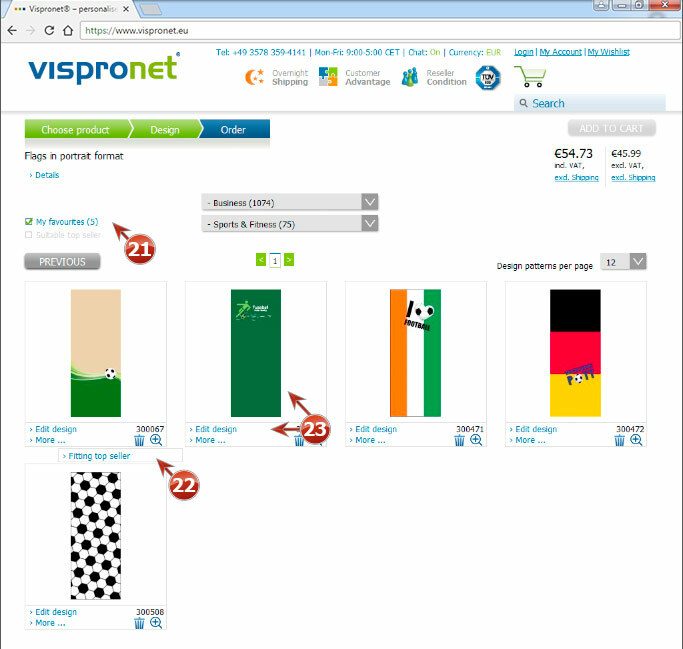 Multi-page products (e.g., seat cube, double-sided flags) can be designed with different motifs on each side. 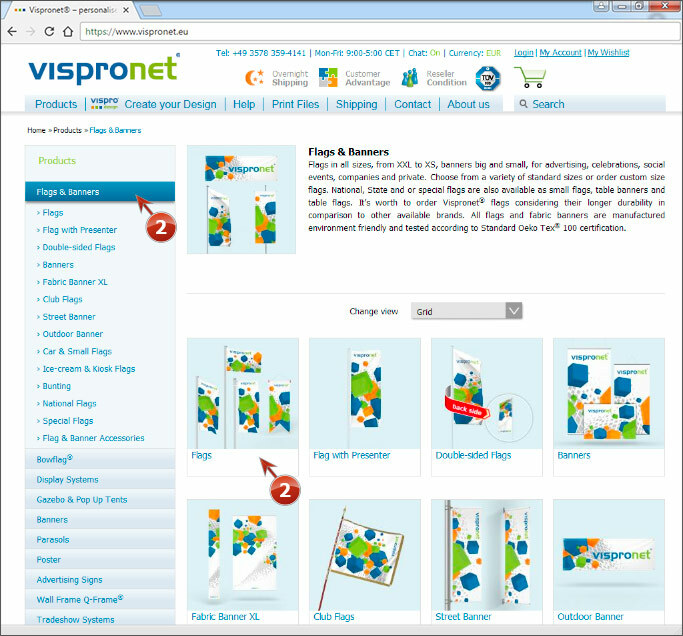 The selected design template is initially placed on the current page view. 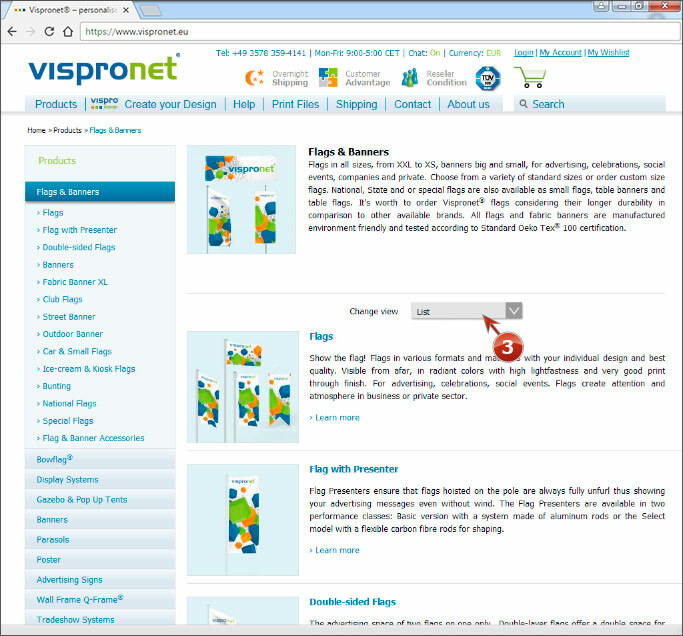 To make individual design changes enable the corresponding page view 32 and then choose one of the already known design options 33. To transfer design of a page view to one or more page views click on "duplicate draft" 34 button and activate the corresponding page views 35. Please note that your design can only be duplicated on the same page view. Otherwise for the different page views the same design template must be reloaded to allow duplication. This concerns primarily our tent products with different side lengths! 36 For multi-page products the "design preview" is available to better recognize individual page views. The "product preview" 37 shows you how the design will look on a finished product. 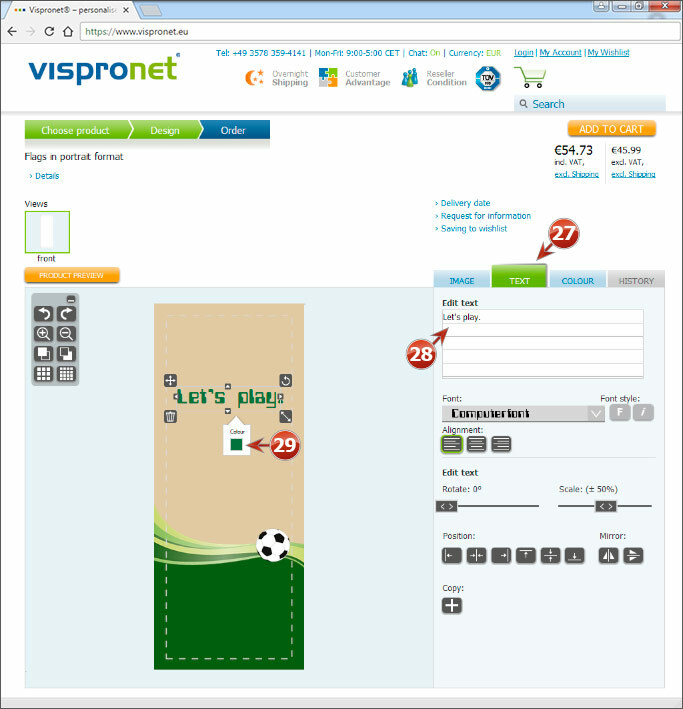 38 When you have finished designing place the product in "add to cart". 39If you would like to save intermediately the design of the product or continue at a later date, you can save the product "to shopping list". You must log in first. 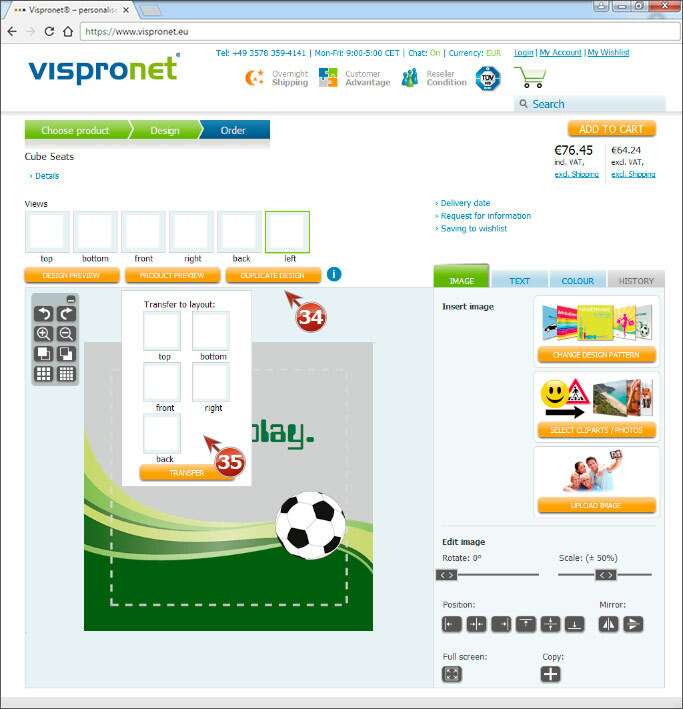 40 Your desired product with current configuration and a preview image of your design will be placed on the wish list. By clicking on the thumbnail it will show an enlarged view of your design. 41 Additionally, by clicking on "change" gives you the option of further developing the product at a later date. 42 Alternatively, you can place the product directly into the "cart". Click "to cart " 4 to complete your purchase or click "continue shopping" 5 to select more products. 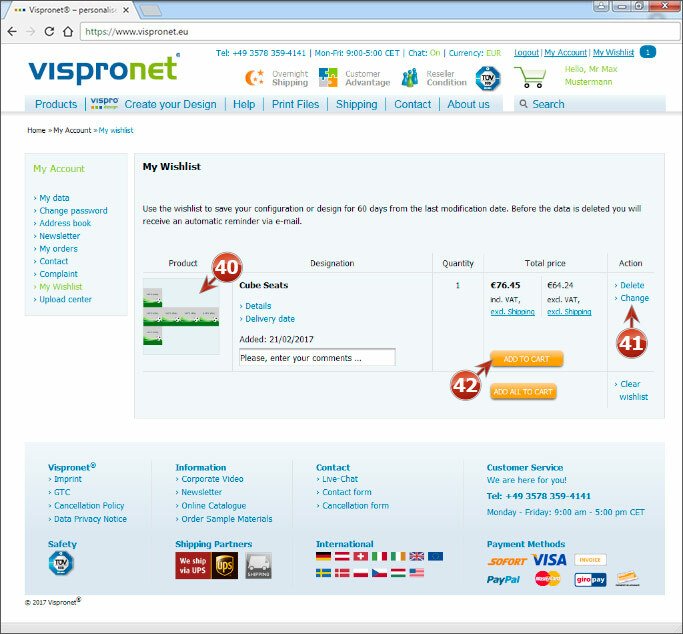 At Vispronet® you can add an unlimited number of products to the shopping cart, allowing you to quickly order a wide variety of products. 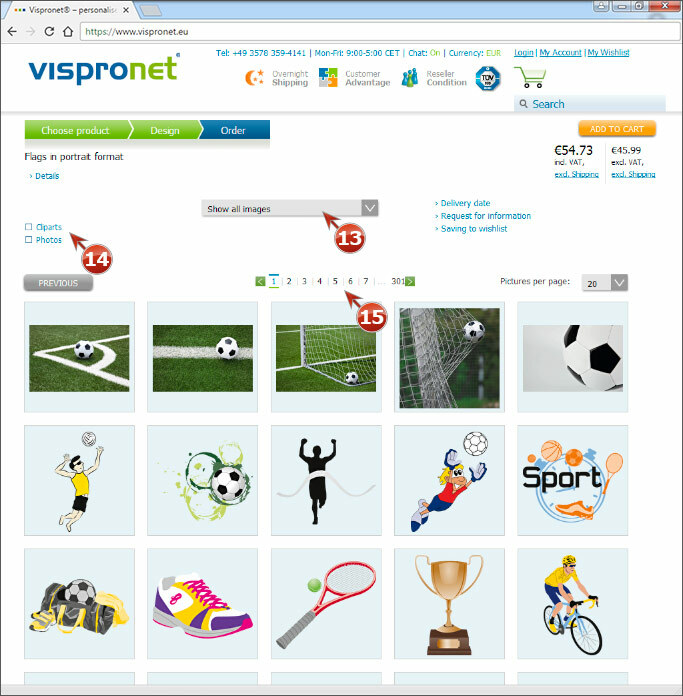 All products and selected services are listed in the shopping cart. You have the opportunity to review your order or make changes. 6 Choose between "continue shopping" or "checkout". 7 After registration or your login, the order can be continued or completed. 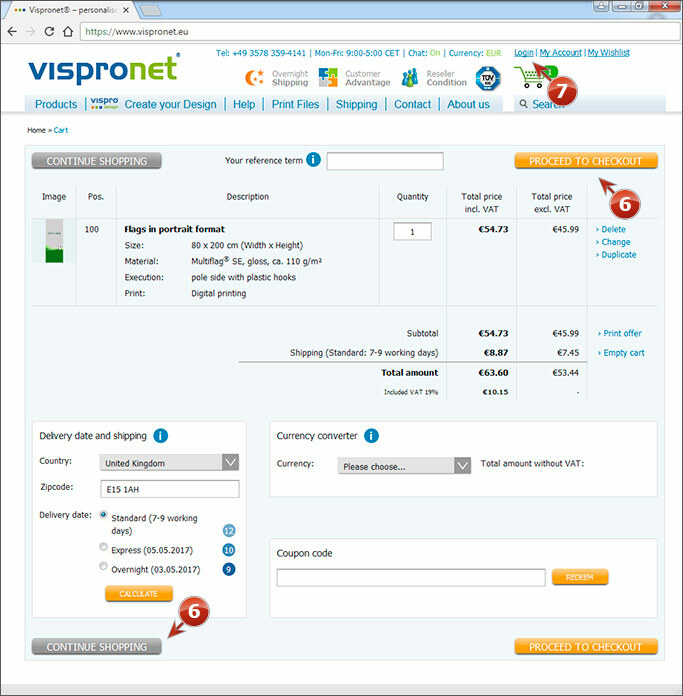 For more information about completing your order see the menu bar > "help" > "ordering process".